Lebanese writer and artist Kahlil Gibran influenced modern Arabic literature and composed inspirational pieces in English, including The Prophet. Kahlil Gibran, baptized Gibran Khalil Gibran, the oldest child of Khalil Gibran and his wife Kamila Rahme, was born January 6, 1883, in Besharri, Lebanon, then part of Syria and the Ottoman Turkish Empire. His childhood in a village beneath Mt. Lebanon included few comforts, and he had no formal early education. However, he received a strong spiritual influence from legends and biblical stories handed down through generations. Seeking a better future, the family, except for his father, moved to the United States in 1895. There they joined relatives and shared an apartment in South Boston, Massachusetts. While registering for public school, Gibran's name was shortened and changed. His life changed when a local art teacher noticed his artistic skill and arranged for Gibran's introduction to photographer Fred Holland Day in December 1896. 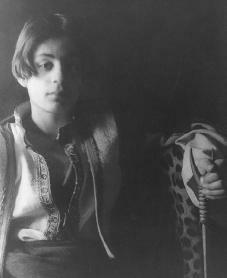 After discovering Gibran's talent for literature and art, Day declared him to be a "natural genius" and became his mentor, or teacher. Gibran soon designed book illustrations, sketched portraits, and met Day's friends. He then went to Beirut, Lebanon, in 1898 to attend Madrasat-al-Hikmah, a college where he studied Arabic literature and started a literary magazine. Upon returning to Boston, Gibran resumed his art work and renewed his friendship with Day. In 1904 Gibran and another artist exhibited their work at Day's studio in Boston. Here Gibran met Mary Elizabeth Haskell, who became his patron (supporter) as well as his tutor in English for two decades. She aided several talented, needy people and was a major factor in Gibran's success as an English writer and artist. From 1908 to 1910 Haskell provided funds for Gibran to study painting and drawing in Paris, France. Before going to France, he studied English literature with her and had an essay, "al-Musiqa" (1905), published by the Arabic immigrant press in New York City. Diverse influences, including Boston's literary world, the English Romantic poets, mystic William Blake (1757–1827), and philosopher Nietzsche (1844–1900), combined with his experience in Lebanon, shaped Gibran's artistic and literary career. After "Spirits Rebellious," an Arabic poem, was published in 1908, Gibran was called a reformer (one who seeks social improvements) and quickly became influential in the Arabic world. He soon became the best known of the "Mahjar poets," or immigrant Arabic writers. His most respected Arabic poem is the "The Procession" (1919). Gibran soon made his mark on the New York artistic and literary world as well. His first work in English appeared in 1918 when The Madman was published. The parables (stories that illustrate a moral or religious lesson) and poems on justice, freedom, and God are illustrated by three of Gibran's own drawings. In October 1923 The Prophet was published, and it sold over one thousand copies in three months. The slim volume of parables, illustrated with Gibran's drawings, is one of America's all-time best selling books, with its fame spreading by word of mouth. By 1931 The Prophet had been translated into twenty languages. In the 1960s it reached new heights of popularity with American college students. Although in failing health, Gibran completed two more books in English— Sand and Foam (1926) and Jesus, The Son of Man (1928). After his death, earlier essays were compiled and published, and his Arabic work was translated into many languages. large group greeted his body upon its return to Besharri for burial in September 1931. Today Arabic scholars praise Gibran for introducing Western romanticism and a freer style to strict Arabic poetry. "Gibranism," the term used for his approach, attracted many followers. Faith is an oasis in the heart which will never be reached by the caravan of thinking. How can you sing if your mouth be filled with food? How shall your hand be raised in blessing if it is filled with gold? Gibran, Jean, and Kahlil Gibran. Kahlil Gibran, His Life and World. New York: Interlink Books, 1991. Hilu, Virginia. Beloved Prophet, The Love Letters of Kahlil Gibran and Mary Haskell and Her Private Journal. New York: Knopf, 1972. Young, Barbara. This Man from Lebanon. New York: Knopf, 1945.